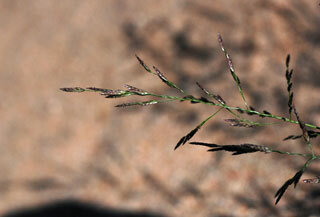 Eragrostis pectinacea (Michx. ) Nees ex Steud. Culms: Low spreading to ascending or erect, slender, hollow to pith-filled, glabrous, often branched; base decumbent. Blades: Flat or with margins rolled inward, 1.6 to 6 inches long, 1/25 to 1/6 inch wide, glabrous or upper surface rough near base; tip tapering to long point. Sheaths: Mostly shorter than internodes, keeled, glabrous, usually with tuft of hairs at collar. Ligules: Dense ring of hairs less than 1/25 inch long. Inflorescences: Panicle, egg-shaped to triangular in outline, broadest below middle, 1.2 to 8 inches long, exserted or partially included in sheath, openly branched with 1-2 branches per node; primary branches loosely ascending to spreading, secondary branches flattened against main branches; rachis bent alternately in opposite directions (zig-zag appearance). Spikelets: Numerous, 3-15-flowered, mostly linear, 1/8 to 1/3 inch long, 1/25 to 1/12 inch wide, flattened, loosely overlapping, parallel to branches, dark grayish-green; short- to long-stalked; glumes unequal, lanceolate, pointed to tapering-pointed; first glume shorter than second; lemmas narrowly egg-shaped, about 1/16 inch long, 3-nerved, rough on mid-nerve, grayish-green; tip sharply pointed. Habitat: Open waste ground, stream and river banks, margins of ponds and lakes, roadsides, fallow or old fields, ditches, edges of lowland woods; moist, sandy or clayey soils. Comments: Carolina lovegrass forms dense tufts and is weedy. It resembles Indian lovegrass Eragrostis pilosa.